Allow up to 10 fingers can simultaneously work together with fingers and no special tools are required. Users can move and scale objects with finger-touch. Act like the precision of the "pen" tasks such as writing or drawing. Powerful software meet all tenders spec. Easily work with microsoft office documents. 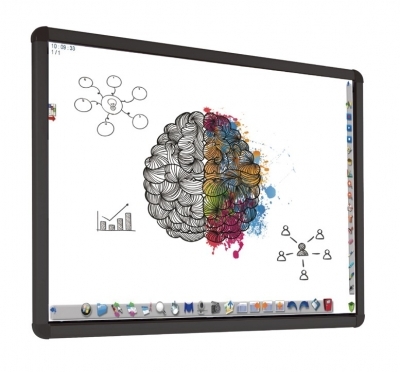 Available size: 78", 89" and 102"
Steel surface is standard; Enamel dry erase surface for projection is optional. ● Allow up to 10 users can simultaneously work on the interactive whiteboard screen. ● No driver required under Windows operation system. ● Any object can be the writing tool. ● Low gloss surface that is optimized for projection. ● Function can be traditonal whiteboard too. Easy wrtie by marker and easy erase. ● No hot spot, keeps eyes of student and teacher safe.